It was hard to get caught up in this celebration. This post goes against my nature as a sports fan. More often than not I tend to find reasons why I believe the teams I like can still succeed even when things aren't going their way. However, today my feelings are the opposite. For the first time in team history, yesterday the Red Sox hit back-to-back home runs in extra innings to tie and then win a game. That's about as dramatic and exciting a victory as you could possibly draw up. And even though it gave them a sweep of the Twins and a three-game winning streak, I can't help but think it's just an anomaly/very lucky coincidence. This Boston team can't score runs. For the entire three-game set with Minnesota the total score was 5-2. 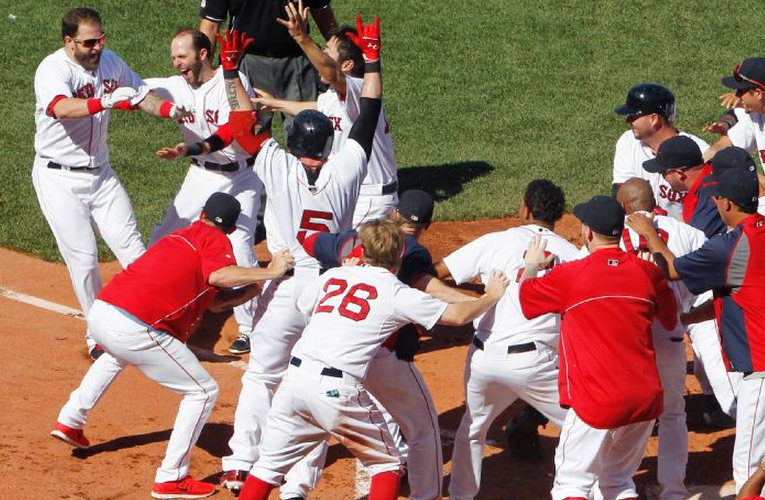 The Red Sox had never won a series of that length before with so few runs, let alone sweep. Boston has now gone 5 straight games with 2 runs or fewer, as well as 8 of their last 10. They've managed to win 6 of 9 overall, but two of the six were by the score of 1-0, and another two were 2-1. The Sox could very well have lost all four of those, making them 3-13 in their last 16 and 30-42 overall; were that the case even the most optimistic of fans probably would be giving up on the season. Boston is averaging 3.86 runs per game this year (down from 5.27 in 2013), which would be the club's sixth lowest output in team history. They're also on pace to score the fewest runs at Fenway Park since 1945 (Gordon Edes discusses both of these and some other disheartening numbers in an ESPN Boston article). Unless something dramatically changes for the Red Sox offensively, this season is going to be a massive disappointment.